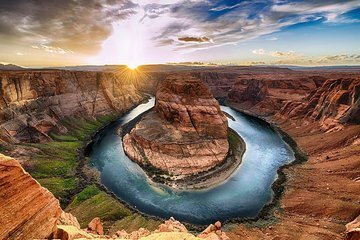 Explore Antelope Canyon and Horseshoe Bend on this guided day trip from Flagstaff. Meet up your Navajo guide and begin to descend into the canyon, the rays of sunlight make for beautiful photos. 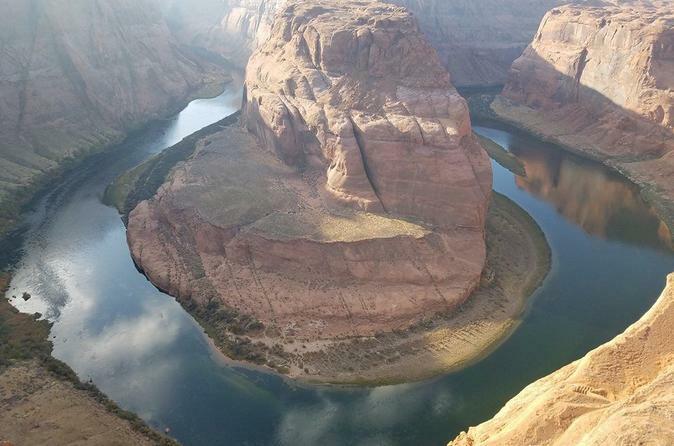 Later, take a 3/4-mile (1.2 kilometer-) hike to Horseshoe Bend, where the Colorado River snakes and bends and twists. It's one of the most dramatic spans of the entire river. We had perfect weather for our tour and it was "the best day ever!". Our tour guide, Drew, who freelances with Grand Canyon Tours, was full of information regarding Arizona terrain, native American culture, canyon and Colorado River facts. It made the driving portion of the tour pass quickly. Lunch was at Glen Canyon Dam (similar design to Hoover Dam). Sandwiches were good and fresh, salad and fruit as well as snacks and water were provided. The landscape of Horseshoe Bend was very interesting, but then Antelope Canyon was just indescribable. Even though I had seen pictures of it, being in the slot canyon was just amazing. On the surface you have no idea that this "world" exists below. Our Navajo guide, TJ, was an expert photographer, able to get the most interesting angles and taking photos of everyone so you can show your friends and family that you were there! Would definitely recommend this tour! Ryan, our driver and tour guide, was interesting and very knowledgeable. Loved his insights about native american history and life today. He was also vey informative about local geology and regional history. Highly recommend!! Lower Antelope Canyon...FANTASTIC. We had a GREAT guide/driver, full of knowledge of the area and beyond. Both Antelope and Horseshoe was amazing! It took me for a loop to see such a creation. I was impressed! There is a bit of wait at Antelope Canyon with the volume of tourists. But the astounding walk through the canyon was worth the wait. Our guide was very knowledgeable, he even assisted us on camera settings to capture the colors of the canyon. It would be best to listen to the guides and follow instructions to avoid unnecessary delays within the group and the groups behind you. The hike to Horshoe Bend is a bit strenuous, especially during summer. Our guide was very helpful and making sure we were well. The view was breathtaking quite literally!. Awesome trip! Marcie was great and very knowledgeable! I would take another tour with her anytime!! The tour was great! great tour guide with all the history! Started out with a 2 hour drive! Then did horsebend was great to see. Then went to the Glen canyon For lunch. Lunch was great! Ended with the Antelope Canyon! Was amazing to see! Stopped at a trading store on the way back to the hotel! Absolutely MUST seen!!! Loved it! Rob was an exceptional and knowledgeable tour guide. He also was a safe and cautious driver. The tour started off with a 3 hour drive to Page, AZ. Rob was giving us a history about the Navajo owned land. Very informative. When we got the upper canyon of the antelope, we waited for our permits. We then embarked on a truck with Nina, our tour guide. Make sure to bring a buff or handkerchief as you will need it for the 3 mile drive in the sand. Once we got to the antelope canyon, it was pretty crowded for December 30. Rob did state it is their busiest time of the year as tourists flock during the new year. Once we got in, Nina and the rest of the tour guides would give tips how to take pictures in the canyon. Very helpful as my pictures turned out pretty amazing. The whole experience was great, if only we got the sunlight, but we were told it only comes out during March-September. We headed back to the bus to have lunch at Glen Canyon Dam with sandwiches, pasta salad, chips, water and soda. You can walk the bridge less than a mile to get a view of the dam and Colorado river. Lastly, was the hike to Horseshoe bend. Bring good walking shoes as it is a hike, but doable. Its about a mile walk. The Horseshoe Bend was breathtaking. Again, it was crowded but you can still take great pictures minus the people in it. Rob drove us all back to our designated hotels and ended the trip on a great note.